Guaranteeing maximum safety of our little passengers has always been a key aspect in the construction of the ATL2000-Jetliner. At the planning stage of the Jetliner already we used the advisory capacity of the TÜV SÜD Product Service. It has been of greatest importance to us to meet and thoroughly implement the high requirements of the European Standards for Playground Equipment EN 1176 in building theJetliner. Upon completion of the prototype a comprehensive final inspection carried out by the TÜV SÜD Product Service took place in our manufactory with the following result: approved by the Technical Inspection Authority and flight clearance given for all future flights. 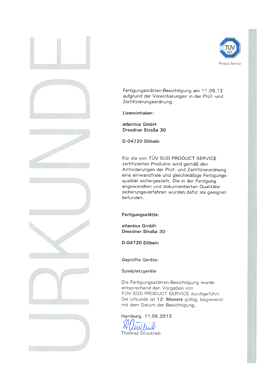 To be able to get a detailed picture of the TÜV acceptance of our ATL2000-Jetliner, please find the above-mentioned certificate on the following page.